DEEP and RESTFUL SLEEP, if that’s what’s needed. A 69 minute journey into Nature and beyond, with the soft, emanating tones of TIBETAN SINGING BOWLS and a BALINESE GONG as your guide. Letting go and surrendering to the beauty & serenity of the moment. Basking in a mesmerizing SOUND BATH of healing sounds, tones, and vibrations. Sinking down into a place of PEACE AND HARMONY, deep inside of yourself. 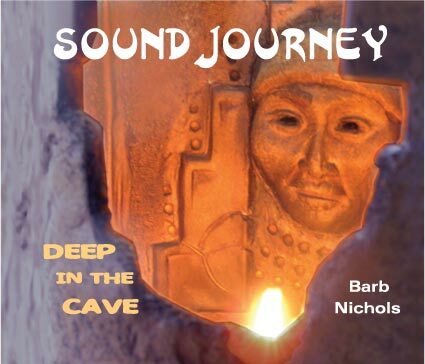 This CD, SOUND JOURNEY: DEEP IN THE CAVE, is also a wonderful accompaniment for yoga, meditation, massage, or simply unwinding after a busy day. “Within just a few minutes, the birds, gongs, bowls, took me somewhere that I have never been before....I’m one of those people with an always active mind that seems to never stop, but this took me to a level of serenity that I have never experienced before. When it was over, I felt like I had been in a trance and was so relaxed....I recommend this CD to anyone who wants to just relax and ease stress.”---H.M.
“Love this CD! My mind wanders as I drift into stillness...”---J.G. “When I listened to ‘Sound Journey-Deep in the Cave’, I was completely blown away.... was transported to a place just outside of my consciousness...was gently called back by the Tibetan bowls and gong.....returned feeling nourished and deeply relaxed.... I also shared this CD with my yoga students. It helps us engage with our deeper selves in the asana practices as well as in the relaxation.”---V.S. “Many of my massage clients request your CD over and over again. It helps them relax at a deeper level.”---M.D. “I gave your ‘Sound Journey-Deep in the Cave’ CD to a friend of mine who has difficulty falling asleep. He says he hasn’t heard it all the way through yet! He falls asleep by about the second droplet in the cave, waking refreshed and rested in the morning. As for myself, I truly appreciate the real earth sounds and naturally resonant instruments so beautifully recorded.”---N.N. “My 10 year old son was having trouble sleeping, was having some nightmares and wasn’t able to go back to sleep easily. I was in a quandary as to what to do to help. He started using your CD every night, and was able to sleep again--and there were also no more nightmares from the time he started using the CD! After a few weeks, he decided to stop using it, and he’s still sleeping well, all on his own.”—C.S.